1) First step is easy, after downloading the program, install everything according to the instructions. 2) Next, after installing, open the program, click on the "Help" tab and then on the "Enter Registration Code..." option. 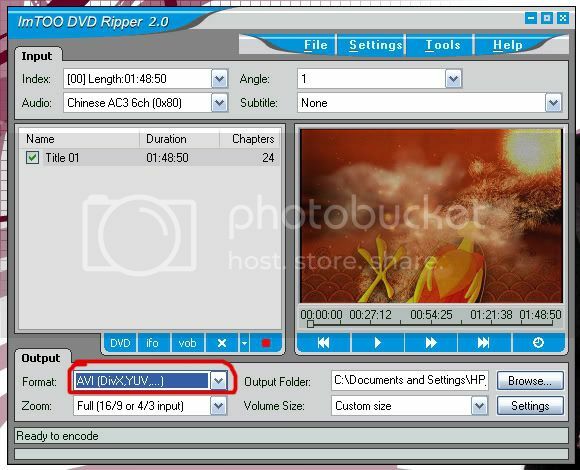 4) Click on the "DVD" option as I've circled in red below. 5) This window will pop up. 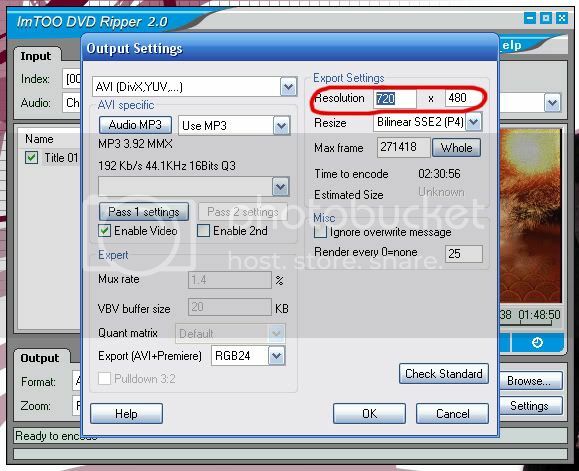 Select your DVD drive (make sure you've inserted the DVD you want to rip into the drive already ^^;;). For my computer it's drive 'E'. 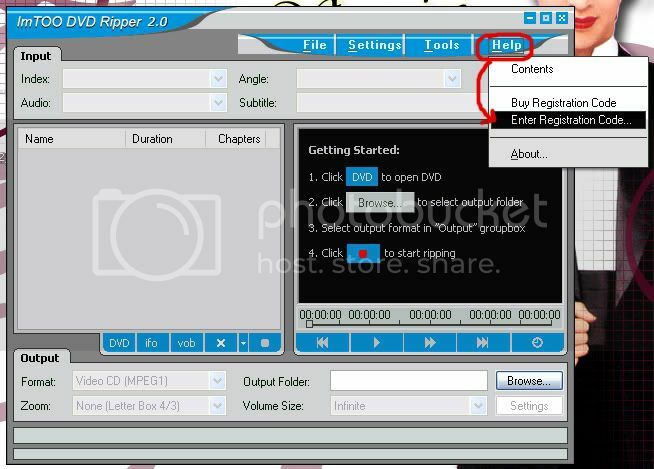 6) After you've selected the DVD drive, the program will import all the 'Title's available. This DVD only has one so it makes selection easy, if there's more than one, the 'Title' that has the longest duration is usually the main show. Other titles might be previews at the beginning of movies and such. If you want to rip everything on the DVD, just check all of the 'Title's available, if you just want the main show, just check the 'Title' with the longest duration. 7) Now for output format (circled in red below), generally AVI is the way to go as that gives the best quality for the smallest sized files. 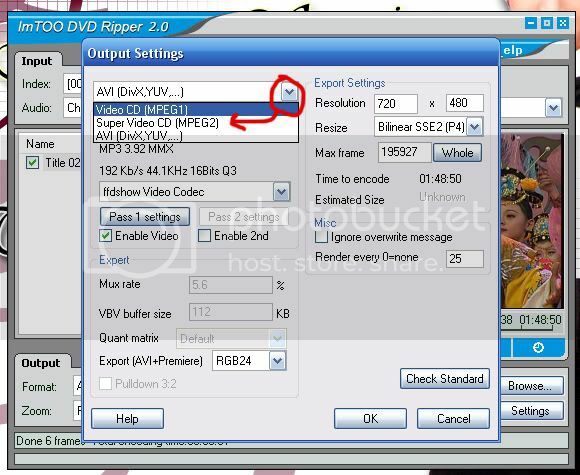 8) For the 'Zoom' choose "Full", otherwise if the person watching wants to change the resolution of the video (you know, sometimes you want to watch full-screen, sometimes at 200% zoom, etc.) the video does wonky things and stretch in strange ways. 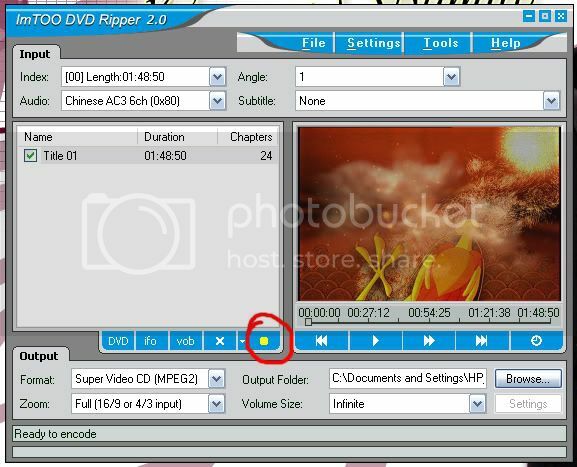 9) Output folder is where you choose where the ripped video file is going to be put into. Remember where you rip your videos to or else it's going to cause headaches later and in the worst case you'll have to re-rip if you can't find it .____. 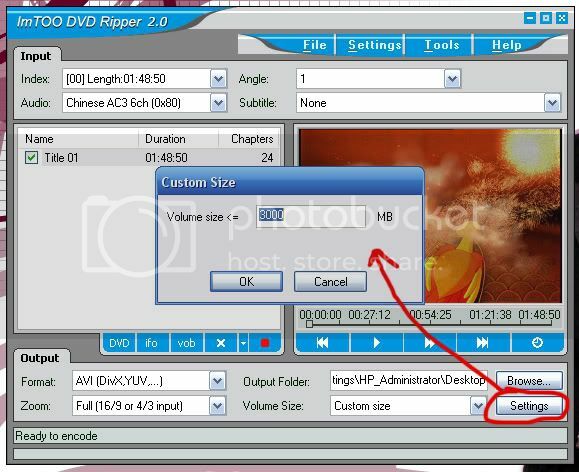 10) Volume size is how big you want your video file in the end to be. I usually either choose "Infinite" or "Custom Size". 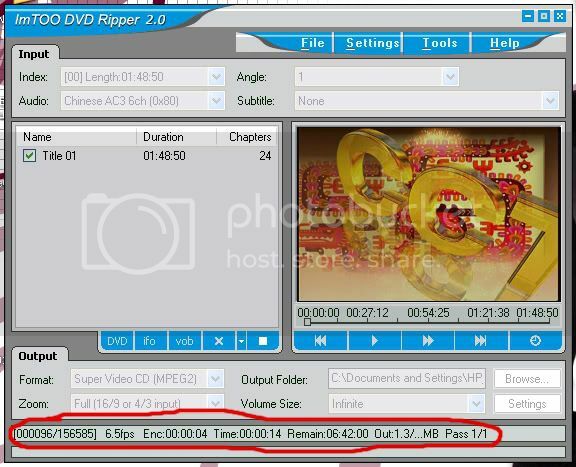 Infinite means the program will rip the video into one file regardless of how big it gets or how long it is. If you choose custom (as the second and third photos below show) you get to choose how big you want the maximum size of the file(s) to be. 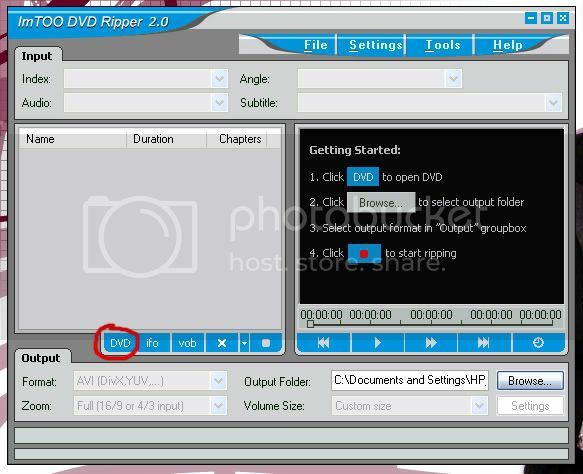 If the entire video is larger than the size you specified the program will automatically split the video into several smaller video files according to the size you gave. 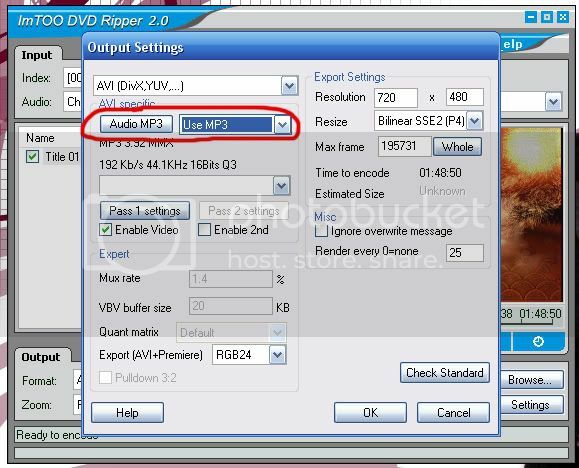 This might come in handy if you're uploading the video onto a service like Megaupload or Sendspace where there's a file-size limit and you don't want to use hjsplit or some other program to split the video. 11) Now for further output settings we go to the 'Settings' tab and click on (of course) "Output Settings..."
12) First up, very important, setting the resolution. We don't want to set the resolution to this tiny little thing (I think default is like, 16 x 16 or something O___o). I usually find 720x480 a good size to go with. 13) Next up, how many frames we want ripped. Ideally most people want the entire video ripped, so click on the "Whole" button. 14) Audio should be MP3, the most common one in usage these days. 15) Now for the video codec. 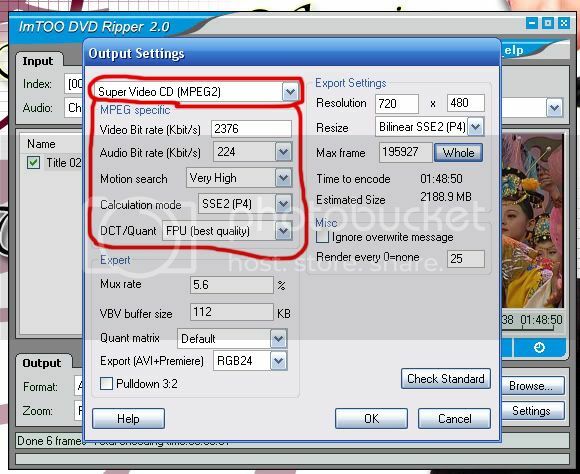 If you don't use a video codec the video is uncompressed and the size goes gigantic, so codecs are good (plus if you don't choose a codec in this program it won't even rip the video for you ^^;;). I usually go with ffdshow. Sometimes, for some reason, the program won't rip using ffdshow codec (you'll get an "AVI streamwrite failed" error message when you try to rip/encode), but for the time being give ffdshow a shot (if you encounter this error I explain how to deal with it in step '17'). 16) Now after you've done all that, click "OK" and then we can start ripping/encoding. 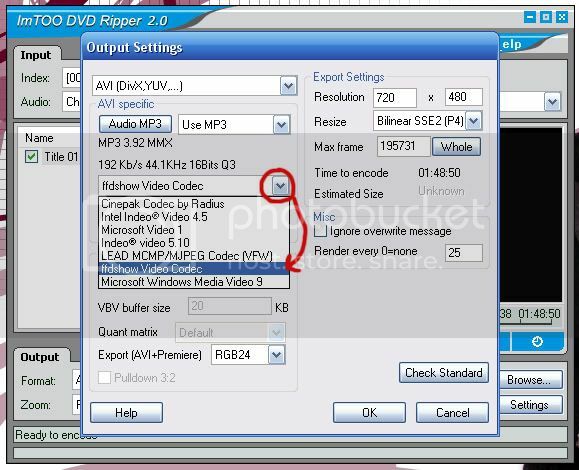 Click on the little "Record" button (circled in red below) to start the process. 17) Now, as I mentioned in step '15', sometimes you get an "AVI streamwrite failed" error message as soon as you hit that 'Encode' button. If this happens, you can try some of the other codecs like Cinepak Codec, however I find with the other ones it takes forever to encode a video (as in, 2 days to encode a 2 hour video) and the size comes out huge (as in 20-something GB for a 2 hour video) which then often leads to problems with playback not being smooth due to the size. Not cool. 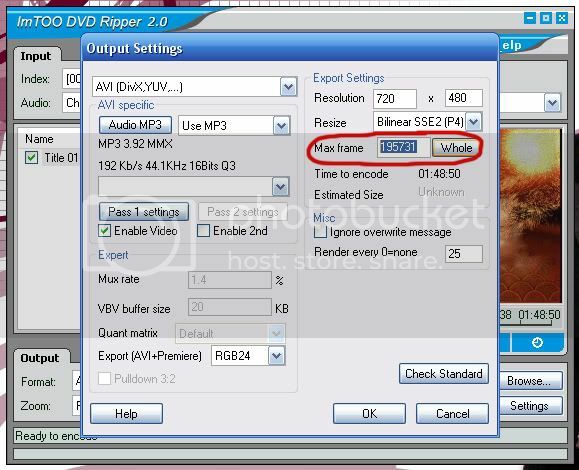 So, my suggestion would be then to go with Super Video CD (SVCD) format instead of AVI. 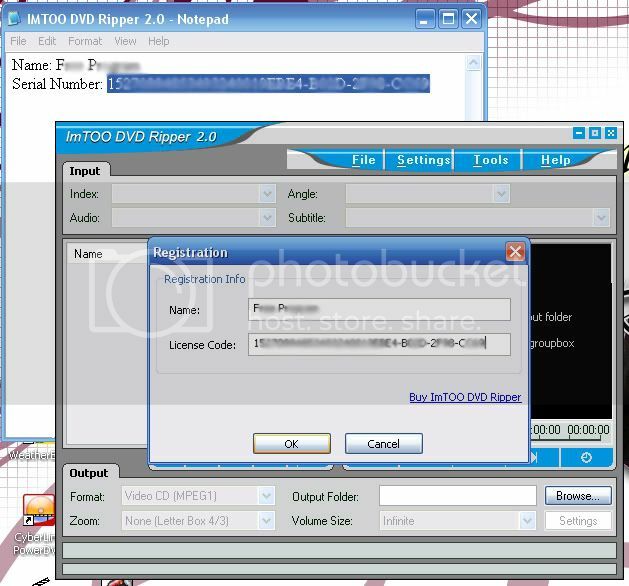 This is basically a MPEG format and although the quality isn't as clear and good as AVI it's watchable plus it won't take you days to rip a movie and won't risk crashing your computer with final file size. 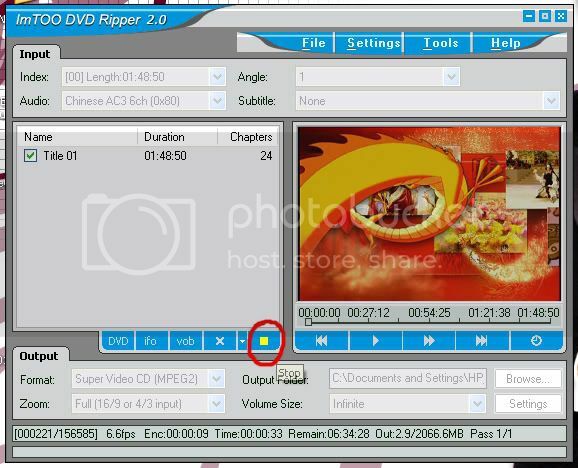 19) The section I've circled in red below appears while the ripping/encoding is going on. 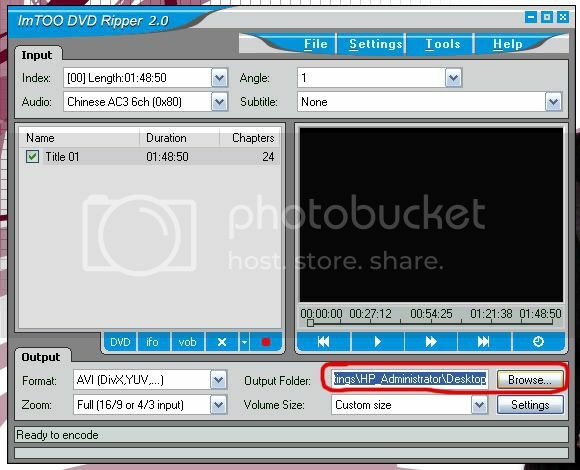 20) Now what I STRONGLY recommend is after you've ripped/encoded a few minutes of the video, stop the process (click on the stop button circled in red below and then hit "YES" when the program wants to confirm) and take a look at the file to make sure everything is working properly (even if you've just ripped a few minutes of the video file you can still view it). There is nothing worse than spending hours ripping a video only to find out after it's all done that something's not right, either the sound is off, or you messed up the resolution and it came out teeny-tiny, or whatever. After you've made sure the first few minutes came out ok, you'll have to start the ripping/encoding from the beginning (just move the little time bar under the preview screen to the beginning), but better than finding out after several hours and THEN having to start over. 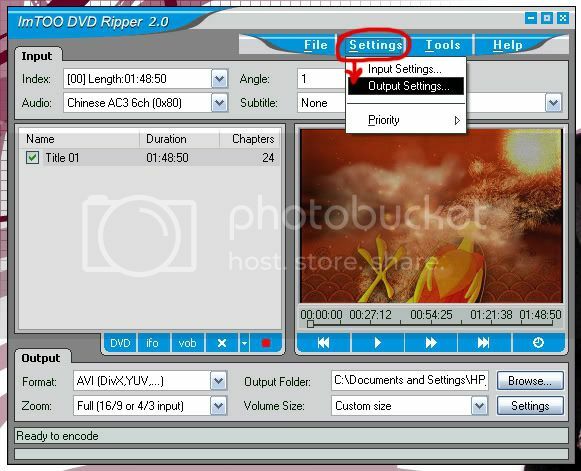 21) This is just an aside, but if you ever want to rip just one section of a DVD and not the entire thing, right click on the title that section is in and choose "Encode Segment..." (as you can see, there's also options like "Encode from Current Position and "Encode Chapters..." that can come in handy too).